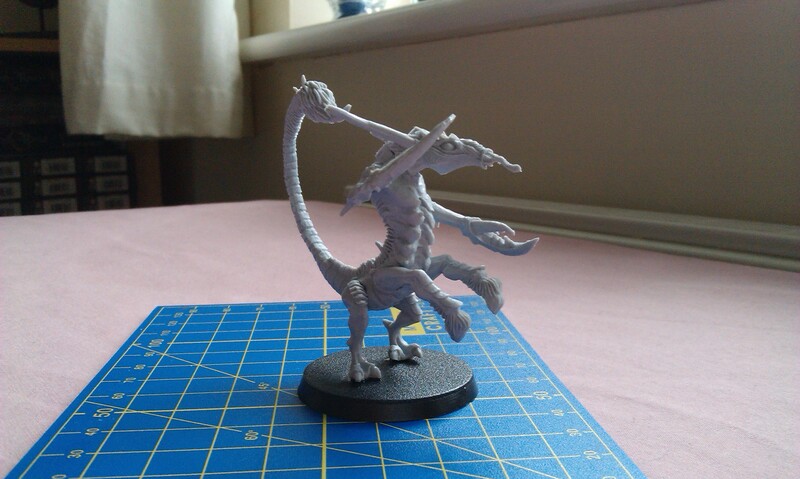 It’s the penultimate week of my hobby progress blogs, and for those of you who are into this stuff, Merry Christmas! Get yourself another mince pie, and let’s take a look at what I’ve been up to this week! It’s actually been another fairly slow week, as I’ve finished off a couple of the things I talked about in last week’s update, but very little else. First of all, let’s look at this, my first ever attempt at proper freehand stuff. For a first attempt, I think it looks pretty great actually, but for what I was trying to achieve, it does leave quite a bit to be desired. The marines themselves look nice, though – I’m actually really pleased with how the Centurion has turned out, and the Command Squad guys look fine and stuff. Standard Alpha Legion scheme at this point, really, and there’s not a lot else I can say about them! My attempt at OSL for the Corvus-Alpha legionaries has turned out pretty okay, again for my first serious attempt at doing it. I’d built up the blue on the armour with Temple Guard Blue, which is brighter than the usual Teclis Blue that I highlight it with anyway, but still hadn’t provided enough of an effect to be really noticeable, unfortunately. I then went in with Baharroth Blue, going lightly over the plasma coils and then building it up with a vaguely drybrush/stipple effect to create the diffuse glow, and while I do think it looks decent enough, I still think the fact that I’m basically doing a blue glow on blue armour leaves the effect somewhat lacking. But it’s serviceable, and I suppose that’s the main thing! Finally, I’ve got a second Tactical Support Squad finished! These guys are equipped with flamers, so it’s the unupgraded version of the unit, and again, they’re just the standard Alpha Legionaries. Since reading about the concept of the tactical support squad, I’ve always enjoyed the idea of having these guys launched at the battlefield in a drop pod and just dousing the whole place in flame, covering a retreat or something super dramatic-like, so I’m glad to have them in the army, even if I never end up doing anything of that sort! I’d set myself a bit of a challenge for Christmas Eve, to get as far as I could with these chaps, and in the event I was just impressed that I’d managed to build them all. Once these have been painted, that will mean I have the minimum force required to play some 30k, so I hope that I can start getting some games in in the new year! The apothecary is for the January painting challenge at my local GW store, where we need to paint an elite unit. 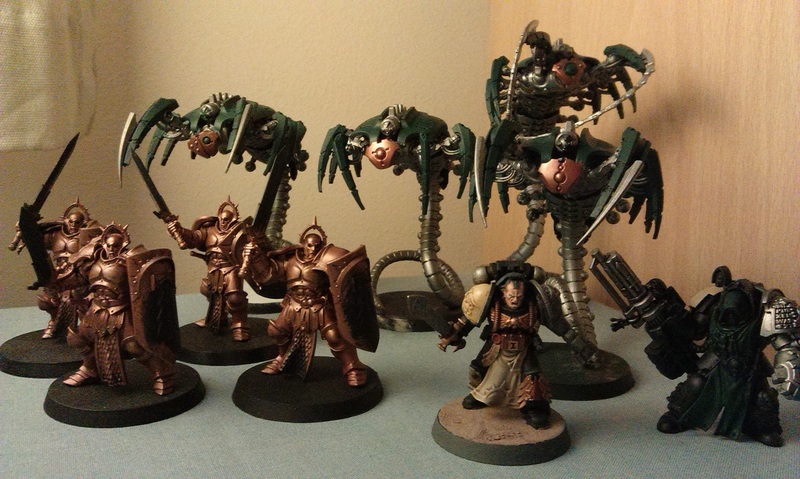 I’m kinda taking the easy route, as I believe most people are using the plastics from the Calth and/or Prospero sets, so terminators, while I’m going for the single apothecary. I do now also have the necessary weapon options to start looking into building some Lernaean Terminators, but I’m hoping to work on some other stuff as we move into 2017, so I want to go easy on it! 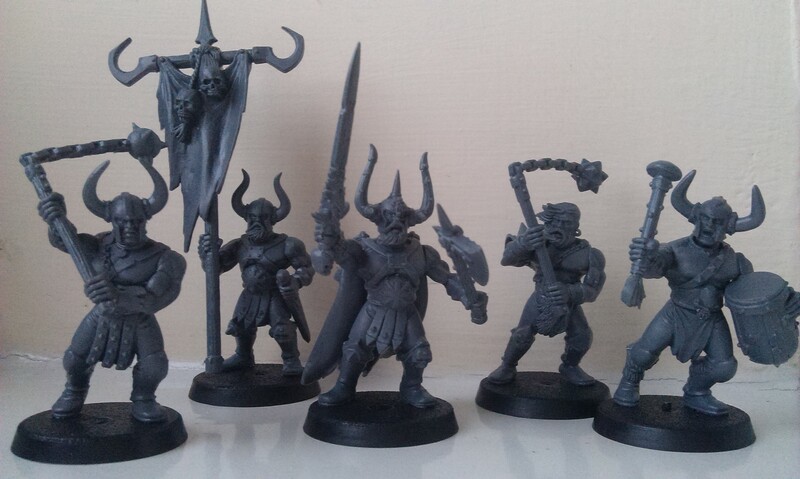 Finally, I built up five Tree-Revenants. 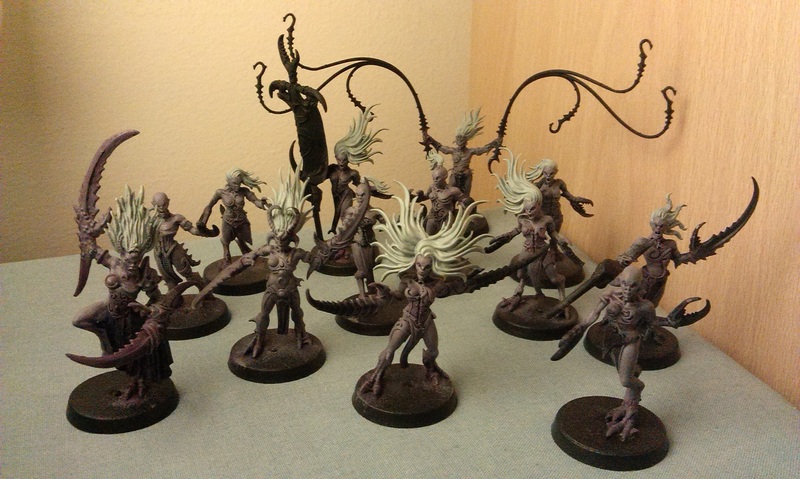 I actually have no idea what I’m going to do with them now as, while I do have some dryads and whatnot, I don’t really need yet more miniatures to paint at the moment!! Anyway, there’s just one week left before the end of the year and the culmination of my hobby progress blogs for 2016. Fortunately I do have the week off work, so I hope to get some things finished – stay tuned for that, at least!! And whatever you’ve been up to today, I hope it’s been a wonderful time! 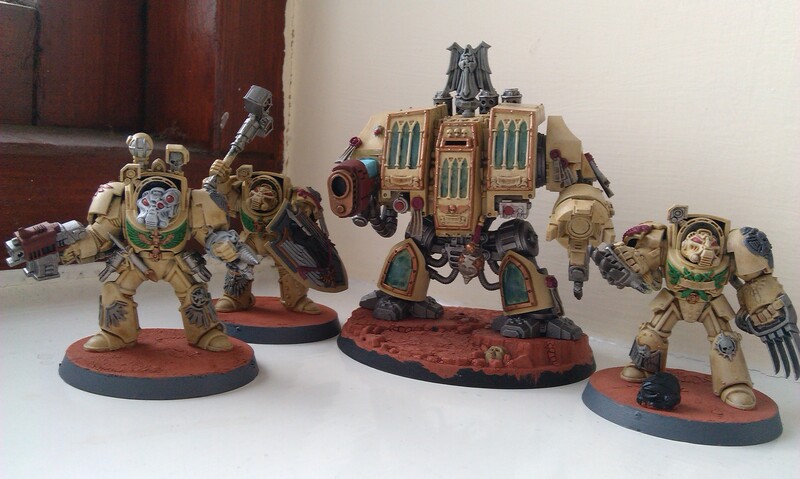 The Deathwing Knights are slowly progressing, much like the Stormcast! I’ve been trying to find a way of highlighting the green robes without making them too bright, and have discovered the joy of Kabalite Green! It doesn’t really look right in the pot, but over three or four coats (whatever it was in the end) of Caliban Green, it’s really done the job for me. 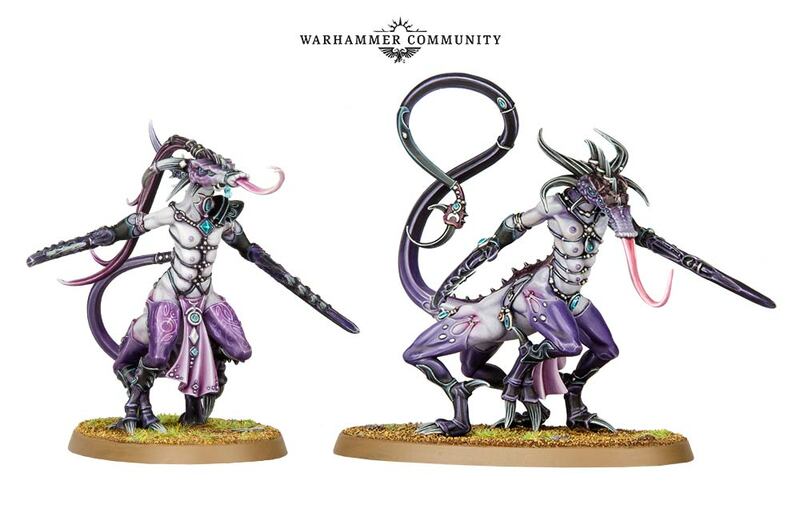 In fact, it looks good enough that I think Warpstone Glow as a final highlight might be enough, rather than going straight from Caliban to Warpstone. So I’m really pleased there! I mean, it makes sense to me! 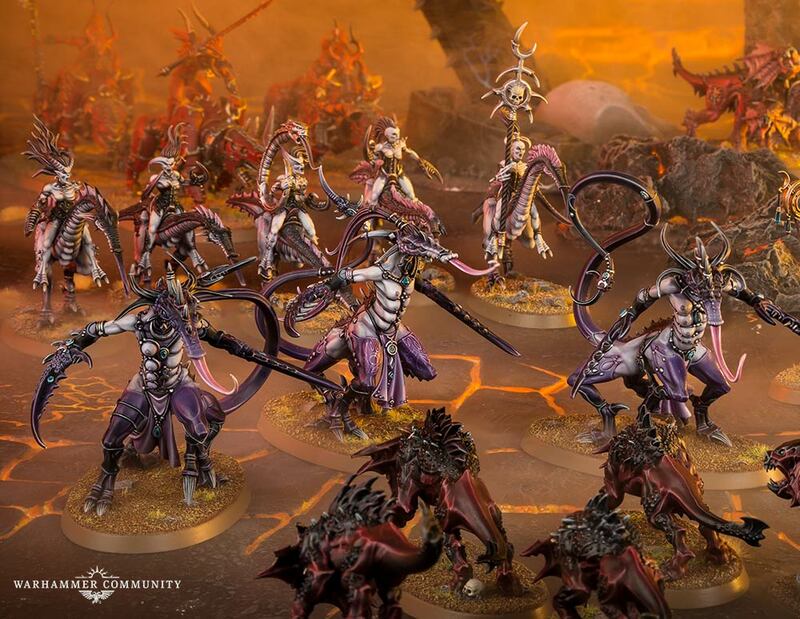 I also think it looks cool, and could make the Daemonettes really look great. 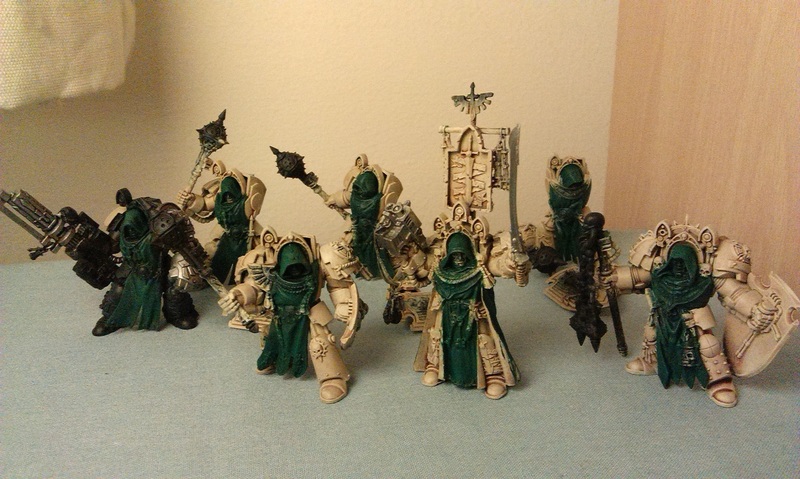 I’m still vacillating over the corset things they’re wearing, but I think I will end up doing them black rather than metallic, and highlight them with Dark Reaper like the Deathwatch armour I’ve been doing, as I think it will keep them looking quite harmonious, keeping them on the blue end of the spectrum. We’ll see! 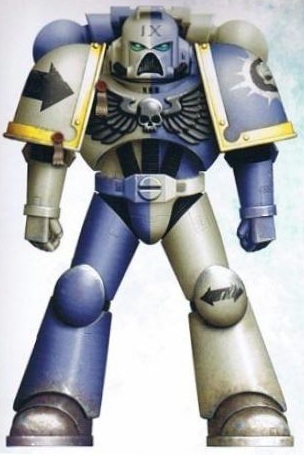 My local GW Horus Heresy thing now has a name: Strokes of Heresy. 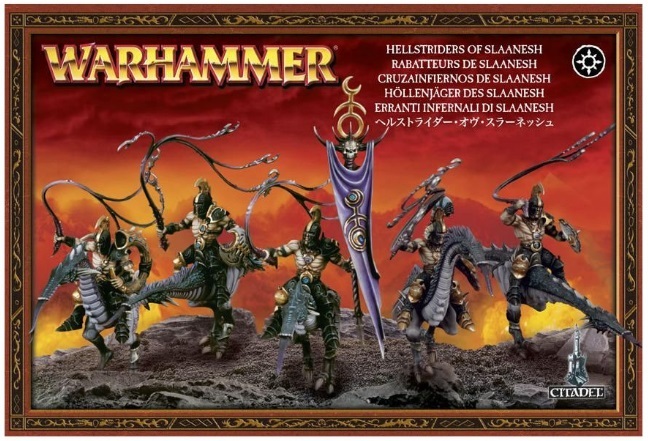 I believe it’s meant to sound kinda wrong, but basically it’s a painting competition campaign, where each month a challenge is set – paint a troops choice, paint an HQ choice – and you get points at the end of the month based on whether you’ve built, painted and based the unit. 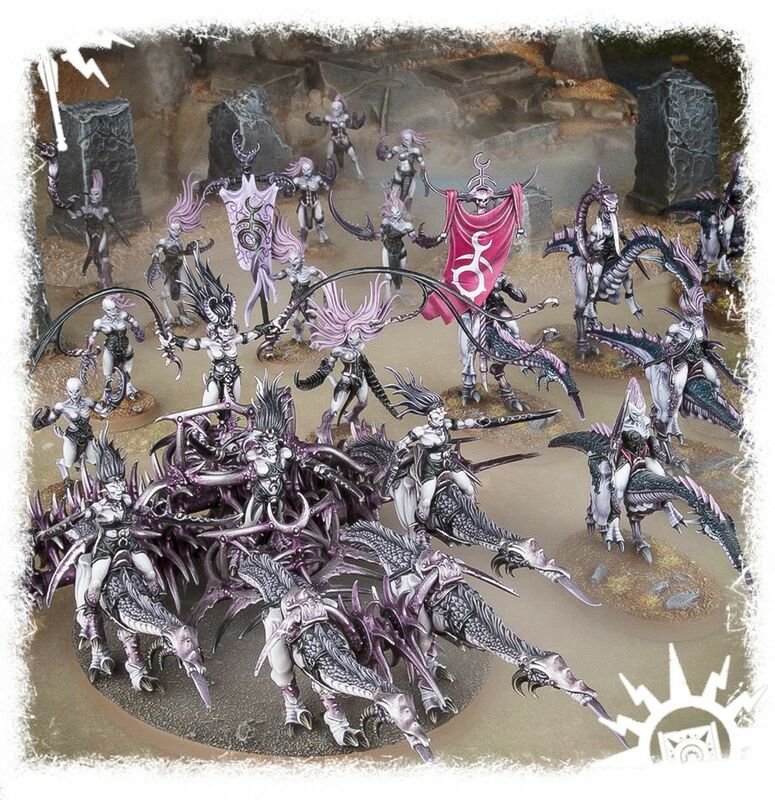 There are additional points on offer if you fully paint any additional units, and if you build and paint the maximum unit size for the month, for instance, and all of this then goes onto a campaign map. 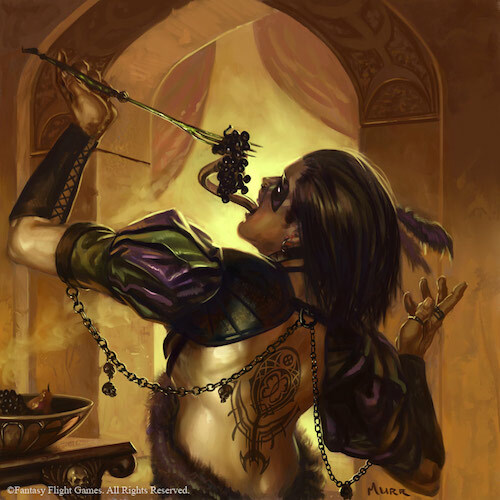 You roll dice to gain territory, which then gives you additional challenges for that month, ranging from using an unspecified texture paint to converting and painting a Remembrancer. 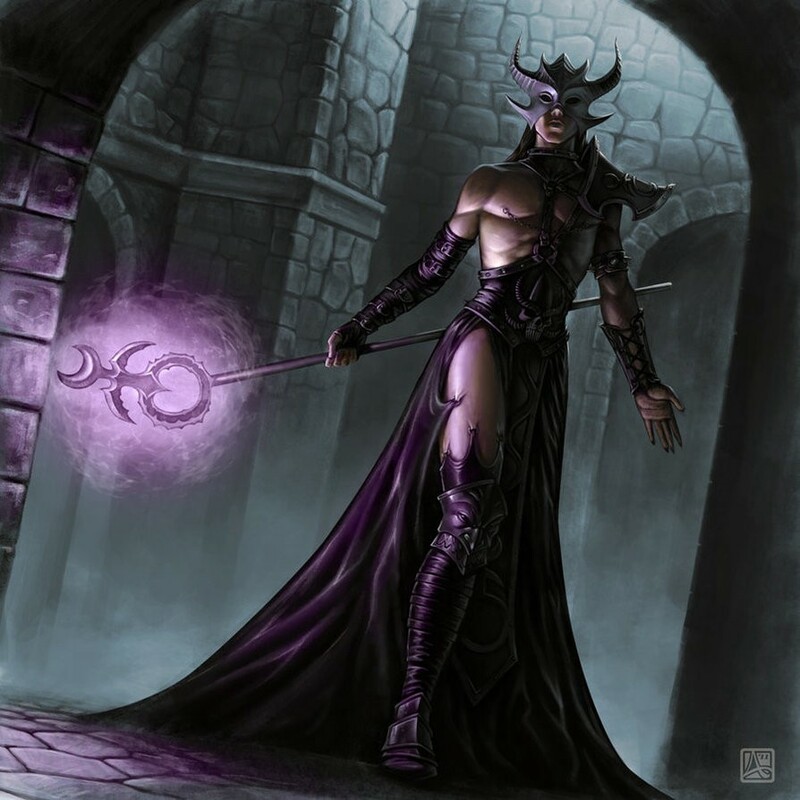 So for November, it was a troops choice, which I’d finished off mid-month along with a rhino, so I’ve got 4 points right off the bat! Unfortunately, the man-flu has kept me away from being able to roll off for this additional challenge yet, but anyway. This month, it’s an HQ choice, so I’ve gone for a Legion Centurion, keeping things simple, but I’ve also been thinking about doing a tactical support squad for a while, so have also built them up! Exciting times inbound! I’ve also gone through and lined the armour recesses on the cream parts with Seraphim Sepia, overbrushing with Flayed One Flesh to bring the flat panels back up, and I think it looks pretty great overall! So they’re definitely coming along now! 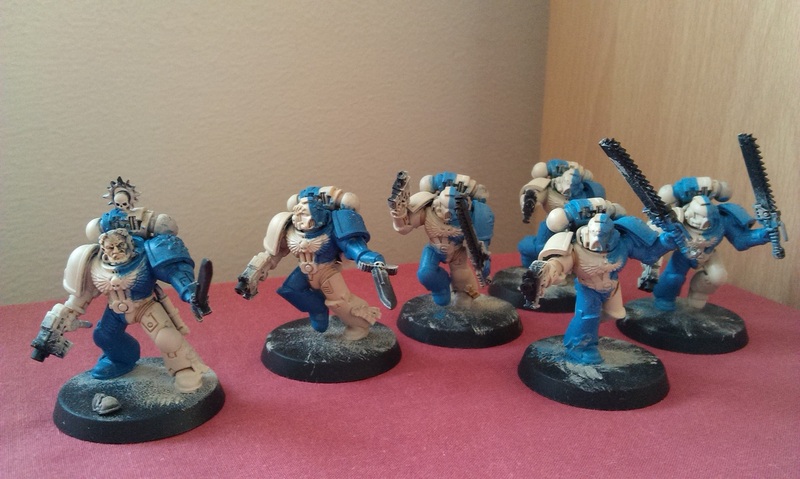 I’ve still got the four tactical marines to basecoat and stuff, but I am feeling really pleased with the progress on these chaps – I’m already further along than I got last time I’d attempted this chapter! I’m now thinking about what I want to do next, and I think I want to kitbash a fancy HQ choice. Flicking through the codex, you can upgrade a captain to a Chapter Master, which just sounds wonderful, so I’m thinking I might do that! 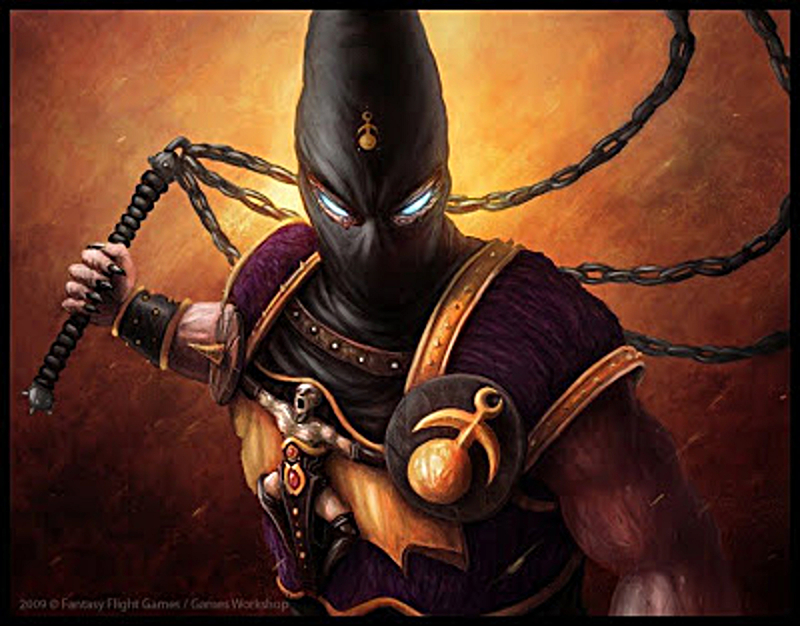 I’ve got one or two bits in mind already, so I just need to figure out the weapon options, and then get building! For this next stage, I want to do a second troops choice so that I can have some measure of legal force with which to hopefully play some games, rather than always going for the fancy options and never having a proper CAD done! So stay tuned for that! 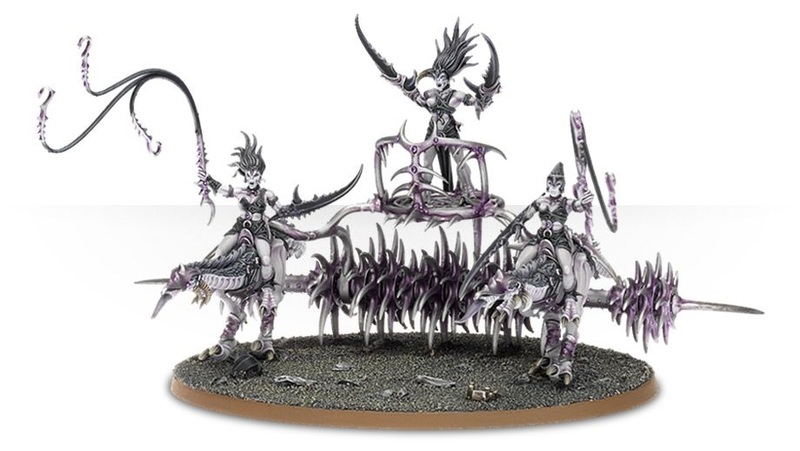 It’s the Seeker Chariot of Slaanesh! I’ve been wanting to put this together since I had it, because it looks so complicated and stuff, but that’s as far as I’ve gotten so far. Hopefully next week will see a little more progress!